Mermaids, dolphins, fish, seahorses and other sea creatures are delightful themes in jewelry, handbags, sculpture and wall hangings. We have selections from a few of our artists shown below, sorted in order of designer. To see more work by any artist represented, you may click on the Item Title, then click where indicated to get the full artist page! Extra large 18 x 16 inch fish is Limited Edition #1/500 (but we had a it made special, so very few may ever appear!). The front is richly detailed in painting of Russian girls dancing to the boy piper, a scene from Russian folk tales. The background of deep blue, purple and green is extended to the back, with a vase and flowers. There are fish-eyes, to remind us that this is an animal shape! 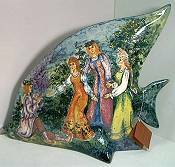 Fish sculpture that is a vase, ceramic work by Ira Burhans of Florida. White earthenware clay formed into a stable piece with an "upside down" vase forming the tail, the body to mouth another "right side up" vase (all merged into one piece and fired). Fully glazed for holding water as flower vase, handpainted wtih fish/fishscale pattern at the center, colors are teal, mint green, blue, berry and black. 22 inches tall, 11 inches across including fins. 2 inches long including goldfill earwire, 1-1/8 inch across the natural twig. Suspended by golden wire below is a 1 inch circle of handmade paper that is colored in marbleized ivory and gold. Cutouts form a splash design, emphasized by white pearl droplets. 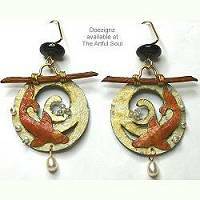 The koi fish circles in paper colored coral orange. Small white pearl dangle and black bead complete the lightweight earring design. 2 inches long including goldfill earwire, 1 inches across including natural twig. Suspended by golden straps below the twig are handmade paper shapes 7/8 inch across colored in marbleized aqua, ocean teal blue, and pearly gold. The graceful shapes form splashing water and the koi fish. Small lily flower of handmade paper is colored in gold, mauve and olive with white pearl accent. More white pearls and black bead complete ultra lightweight earring design. 6x6 inch terracotta tile, 7/16 inch thick, has 4 pads on back to use as a trivet for the table. Also has hanger to decorate a wall! Hand-printed and glazed, a delightful gift. Motif as shown in bright blue color. 6x6 inch terracotta tile, 7/16 inch thick, has 4 pads on back to use as a trivet for the table. Also has hanger to decorate a wall! Hand-printed and glazed, a delightful gift. Motif as shown in dark blue color. Colorful octopus is delightful with each leg in a different color of porcelain. There is blue, teal green, orange, lime, pink, lavender, yellow, forest green, coral, black and ivory. Flexible black wire curls outward with tiny bead accents. Horizontal barpin clasp. Measures 3 x 2-1/2 inches overall including wire. Seahorse has porcelain body sculpted into ornate curling shape, richly patterned with colors of blue, coral, aqua, forest and lime green, along with black and ivory. A crystal bead extends from the mouth, and flexible black wire dotted with beads extend out from its head and back. A long flexible wire curling out from the end of the tail is beaded brightly. Measures 3 inches tall overall, the width with extended wires is 3-1/2 inches. Vertical barpin clasp. Dramatic 23 inch tall ceramic vase, 9-1/2 inches across, made by Kelly Jo Kuchar of Albuquerque. Fully glazed ceramic, the interior is white. Exterior decorated in trout pattern in deep cobalt blue, orange, green, aqua, yellow and black. 1-1/4 inches long on sterling earwire, 7/8 inch across. The fish are fused glass mosaic mounted on black backing. The sparkling dichroic colors include aqua, cobalt, pink and lime. 7/8 x 7/8 inch fish is fused glass mosaic on black background. The sparkling dichroic glass colors include cobalt, purple, pink, yellow, with a black bead eye. Attached silvertone bail, comes on 16 inch black rubber cord with non-metal clasp. Overall 2-5/8 x 2 inches, the glass body is 3/4 inch across. Fused glass on black background, the depths reveal dichroic sparkles in emerald green and cobalt blue, silvertone tentacles extend outward. Attached silvertone bail, comes on 16 inch black rubber cord with non-metal clasp. Overall 1-5/8 x 1-3/4 inches, the glass body is 5/8 inch across. Fused glass on black background, the depths reveal dichroic sparkles in dark cobalt and sapphire blues, silvertone tentacles extend outward. Attached silvertone bail, comes on 16 inch black rubber cord with non-metal clasp. 1-1/2 x 3/4 inches. Fused glass on black background, there is a mosaic of individual pieces from head to tail with black bead eye. Sparkling dichroic colors include purple, green, gold, pink and aqua. Attached silvertone bail, comes on 16 inch black rubber cord with non-metal clasp. 3-1/4 inches long (excluding key ring). Smoke, black and red synthetic resin shapes are joined with black and lime beading. The graceful fan-shaped scallop from the sea, but this one has peacock colors! The undulating shape measures 6-1/2 x 6 x 2-1/4 inches, all surfaces covered by glass beads, crystals, shells, stones and ribbon. 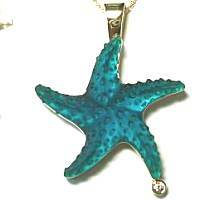 The colors include spring lime green, turquoise blue, silver, bronze gold and pearl. The front has extra starfish, flower and shell cluster at the bottom to bring in more of the champagne/pearl natural colors. Opens like a clamshell, closes with flap over the top and magnetic snap. Inside lined in lime green with small open pocket and gusseted sides to keep your things in when open. 30 inch beaded shoulder strap detaches, so you can tuck inside to use bag as a clutch...wear the chain as a perfectly coordinated necklace! 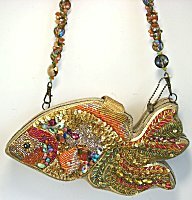 5 x 4 inch ornament made with nickel, brass and copper, Angelina is a fish with pearly color beads as bubbly accents. Metal pieces are soldered and wire-wrapped together, beads also are wrapped into the piece with wire. Comes on 2 inch silver hook hanger. 2 x 1-1/2 inch polished pewter pin depicts a fish with stamped patterns, and soldered brass spirals for eyes. Horizontal barpin clasp.